KHARKIV, Ukraine -- The story of a Chinese man who started his own business and married a beautiful woman in Ukraine has lit up Chinese social media sites, where netizens have expressed envy over the man who came from humble beginnings and ended up livin' the dream in a foreign country. 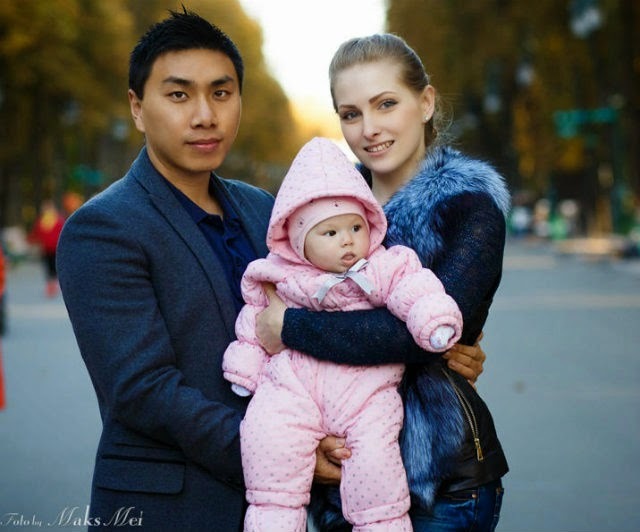 Mei Aisi poses with his wife and daughter. Mei Aicai is from Chengde, Hebei province. He never performed particularly well in school and scored only 320 in his gaokao exam 12 years ago. Although Mei knew nothing about Ukraine (he thought it was in Africa), he decided to move to Kharkiv for a higher degree, Tencent News reports. ”Before I left the country, I went to Shijiazhuang and learned Russian for a month, but ultimately only learned 'hello, I want water'. When I got on the plane, I was really nervous, not knowing what would be waiting for me in an unknown country,” Mei said. Upon his arrival, he took a preparatory course at the local university, and because he didn’t speak the language, encountered a number of obstacles in his first few months there, according to Lollipop.sg. Mei's parents are average, working-class people. He sought education in Ukraine mainly because the cost of education is similar to China. “Only after going out in the world did I slowly understand my parents’ hardships. For the first two years, the things I ate the most were potatoes and cabbage, as these two things are the cheapest in Ukraine," he said. After graduating from his 1-year preparatory course, Mei attended the Kharkiv Academy of Fine Arts, where he was the only person who couldn't draw. During his first semester, he skipped class a lot and spent most of his time playing video games or playing ping-pong at the gym. Through ping-pong, he started making Ukrainian friends and met his future-wife. Mei and the 17-year-old woman, who was still in high school, eventually wed and she took the name Mei Dasha. ”She may be young but her views are very mature. At school, she is a good student with excellent grades and at home, she is a good wife, keeping our home neat and tidy, doing the laundry and cooking," Mei said. With her encouragement, he quit his job as an animator and started his own business. He now runs a company involved in the importing and exporting of equipment, oil and grain. He recently purchased 3,000 square meters of land, where he's building a villa. "Some people think I am very successful, but I feel my greatest happiness comes from my family. I come home everyday on time to eat with my wife, and afterward we go for a walk. I feel this kind of life is very happy.” Mei said. Tens of thousands of web users went on forums to discuss Mei's success story, many of them jokingly remarking that they want to go to Ukraine as soon as possible. One user named 不离不弃 wrote: "I'm hopeless here in China. He purchased 3,000 square meters of land for a villa and he married such a beautiful wife." "He said Ukrainian girls marry less for money and more for love," user 十年 wrote, simply repeating Mei's words. Another remarked: "No matter if you are a ‘super scholar‘, the way to success is through EQ [emotional intelligence]. Mr. Mei is a man of knowledge, even if he didn't achieve high scores in the gaokao. Mr. Mei's EQ is probably higher than his IQ. Not everyone can be as lucky as him. I wish good luck to him, his beautiful wife and their lovely baby. "